Last year I read over 60 books and surprisingly, my top five favorites were read mostly at the beginning of the year. Not surprisingly, I didn’t write reviews of all of them. For the ones that don’t have reviews, I’ll be writing those later this week. Not all of my favorite reads were released in 2010. My husband will be surprised Stieg Larsson’s Millennium Trilogy didn’t make the list and I’m a little surprised too. They weren’t books I wanted to force into people’s hands to read although they certainly have tweaked my perspective about Sweden a bit. I didn’t set out to do any challenges this year but I did want to read Reading Like a Writer by Francine Prose. It’s been sitting on my TBR pile since December 2008. I failed but will definitely read it this year. How can I write that with confidence? Because I started reading it two weeks ago. Atkinson’s writing pulls the reader into another world where bad things happen but there is always someone who wants to prevent the bad things or pick up the pieces afterwards. The first part of the book, titled “The Past” takes the reader to a summer day thirty years before the present day tale begins. The reader gets so caught up in the the events of that day it takes a while to realize the little girl is now a woman with her own family. Jackson Brodie and Louise Monroe (both featured characters in One Good Turn) do more than cross paths and have made permanent marks in each other’s lives. As far as I can recall, this is the only book I’ve read in which a secondary character gets primary character billing in a sequel. I read somewhere Walter Mosley has done this but I’ve not seen it for myself. Most of the time I read a book in a vacuum because there isn’t anyone else to talk to about it. The readers in my life either don’t read the same books as me or they read them years after I do. This is one of those books I wish I could talk to someone about. The ending caught me by surprise and my heart broke a little. Some authors believe in putting their characters through hell to create a metamorphosis. All I can say without providing any spoilers is there better be a happy ending but I doubt it’s coming. Kate Atkinson lives in Edinburgh. Her first novel, Behind the Scenes at the Museum,was named Whitbread Book of the Year in the U.K. in 1995, and was followed by Human Croquet, Emotionally Weird, Not the End of the World, Case Histories and One Good Turn. What does a writer, two teenagers, the wife of a shoddy home builder, and a retired cop turned ex-detective now millionaire have in common? They’re all witnesses to a fender bender at the Edinburgh festival. It’s a seemingly ordinary accident that quickly escalates into an assault before being diffused by the writer. And this writer doesn’t use words to get the situation under control. In fact, he’s a writer who is a little bit tired of words. Or more accurately, the words and exploits of the main character in his series of best selling novels. His actions have unintended consequences. The teenagers are cutting class and looking for a thrill. One is headed towards a life of crime – too intelligent and bored for his own good. The other is an awkward teen who happens to be the son of a police detective, Louise Monroe. Louise ends up investigating events that may or may not be related to the car accident. Louise and her son, Archie, live in one of the poorly constructed homes built by Gloria’s husband. When the home construction business was small Gloria kept the books. Now she’s cut out of the day to day stuff but she knows the homes aren’t built well or with good materials. Investigators are closing in on her husband’s business. Jackson Brodie from Case Histories returns to One Good Turn as a man trying to find himself. The curse of being a millionaire is the lack of purpose in one’s life. He’s helped finance a play at the Edinburgh festival with his girlfriend as one of its cast members. Uncomfortable in London or his house in Paris this is a holiday from his ordinary life. This novel was a delight from beginning to end. Tense moments, such as a Jackson Brodie alley fight scene, can turn comical with just a few unexpected words. One thing I noticed is the reader gets to hear the important characters’ thoughts. While more than one of these characters can be in a scene together, the reader only gets to know what one character is thinking. Any more and it would get to be a confusing jumble. 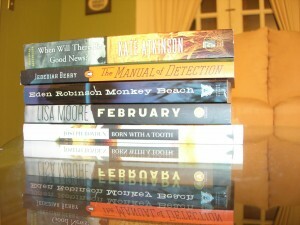 Atkinson’s next novel, When Will There Be Good News?, has Jackson Brodie and Louise Monroe in it. I swore I wouldn’t let myself read it until I was done with this review. I cheated and began reading it a few days ago; that’s how badly I wanted to know what happens to them. You can find out more about Kate Atkinson and her books on the Kate Atkinson Ning Group. A big thank you to Marcia at The Printed Page for hosting Mailbox Monday. This week was a big one for me since I went to Toronto for a few days and tried to pick up some books by Canadian authors while there. Not shown in the picture is Unearthed: An Anthology of Suspensein e-book format from Edmond Cheng. Novellas included in the anthology are “Last Fragment” by Shawn McPike, “Help Me” by David A. Stelzig, “Crown of the Earth” by Seth E. Lender, and “Illusion” by Edmond Cheng. 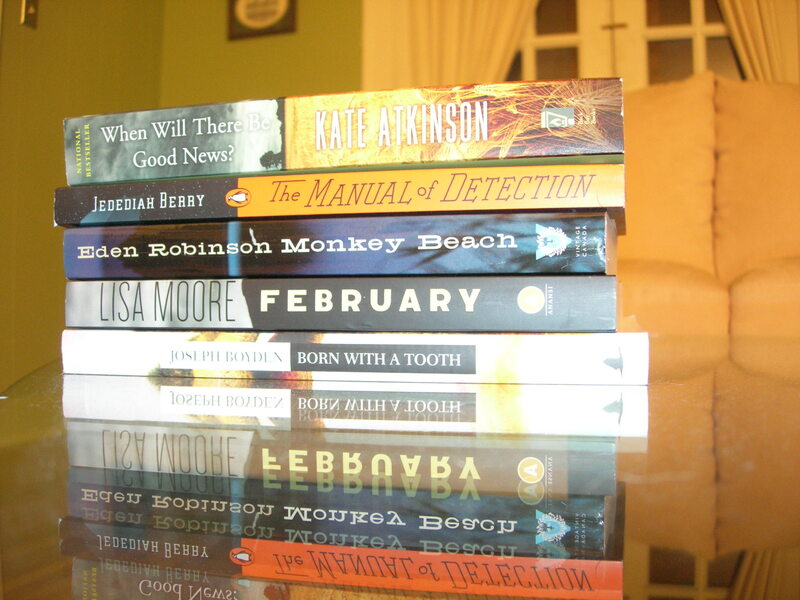 Miriam with the Hachette Book Group sent me a copy of When Will There Be Good News by Kate Atkinson. A fitting arrival since I finished One Good Turn over the weekend.